Policing America’s Educational Systems, edited by J. Harrison Watts, describes methods of policing modern educational settings, covering both K-12 public school and public or private colleges and universities. Using topical examples, subject-matter experts introduce the history of policing in elementary and high schools, the legal context governing educational institutions, and ways to assess risk and prevent or respond to crime, including active-shooter incidents. The opening section covers primary and secondary education, while the second focuses on post-secondary educational settings. A final section offers a theoretical approach to understanding campus crime and discusses the role of counselling and mental health in keeping students safe. 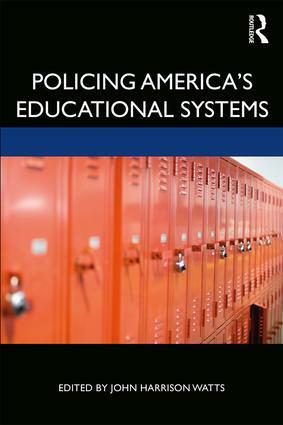 A concluding chapter looks at the future of policing in education. Contributors bring both academic and practitioner experience to each topic covered, and useful features include learning objectives, chapter summaries, key terms, and discussion questions that further explore the issues and controversies covered in that section. This textbook is designed for courses in school or campus policing within criminal justice, social work, and sociology programs, and is also appropriate for in-service training for professionals involved in school or campus policing and safety. This text examines much more than the complex intricacies of policing America's school systems. The chapter on school counseling and mental health touches on an important area of school safety that is oftentimes overlooked. Dr. Watts provides a complete A to Z reference guide to policing America's schools. The chapter on policing the college campus brings the reader into the management team briefing room where one learns how to effectively combat threats on the college campus. Doshie Piper, Ph.D. & Georgen Guerrero, Ph.D.
John Harrison Watts, PhD. Dr. Watts is a professor of criminal justice at Our Lady of the Lake University in San Antonio, Texas. He has spent over 20 years in higher education with former faculty appointments at Washburn University (Kansas), Cameron University (Oklahoma) and Vernon College (Texas). Prior to teaching, he was a former decorated police detective and criminal investigation division commander who holds a Master Peace Officer license through the Texas Commission on Law Enforcement. He is a graduate of the Bill Blackwood Law Enforcement Management Institute of Texas’ Leadership & Command College. His research interests and publications are in policing and law.